Gilly the Goanna has struck gold and he needs your help collecting all of his nuggets before Bossy the Bilby steals it! Click here to play! If you can mine all of the gold in time, you'll walk away with a small fortune! Stick close to Gilly as you head down into the mines. He is a substitute and will replace most other symbols to help you create more wins. Spin one to five of him across a pay line and you will get up to 20000 times your line bet! Watch out for Bossy while you're hard at work. Spin two to five and you'll get up to 5000 times your line bet. There are a few other things to keep an eye out for as you mine your gold, namely bats. Spin two to five of these and you'll get 2500 your line bet. Carts full of gold and lanterns will also help you in your mission to collect your fortune as each will get up to 500 times your line bet. The nuggets are what you're really after though. Spin two to five of these little golden rocks and you'll get up to 200 times your total bet. Not only that, but they also act as a scatter and will trigger a bonus feature if you spin three or more. Can you help Gilly the Goanna collect his fortune? If you mine all the gold in time, you'll leave this game with a sizeable fortune of your own. The shimmering gold nuggets act as a scatter. If you spin two or more anywhere on the board, you will get up to 200 times your total bet. Gilly the Goanna is a wild. 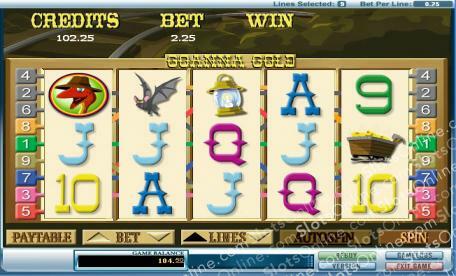 He will substitute for all other symbols (except scatters) to help you create more winning combinations. Spin one to five of him across an active pay line and you will get up to 20000 times your line bet. The scatter golden nuggets will trigger a bonus game if you spin three or more anyhwere on the board. During this feature you will have to choose from a selection of tiles to find gems hidden beneath. Each gem is worth a different amount and you'll need to match two or more to get your prize.